The Goldfish Autocrat was their first branded pencil. It was originally scented to smell like sandalwood--though they don't to that anymore because it's too expensive. Shehzhad (original owner's grandson) isn't sure where exactly the name came from, though he's pretty sure 'Autocrat' was supposed to be 'Aristocrat'. 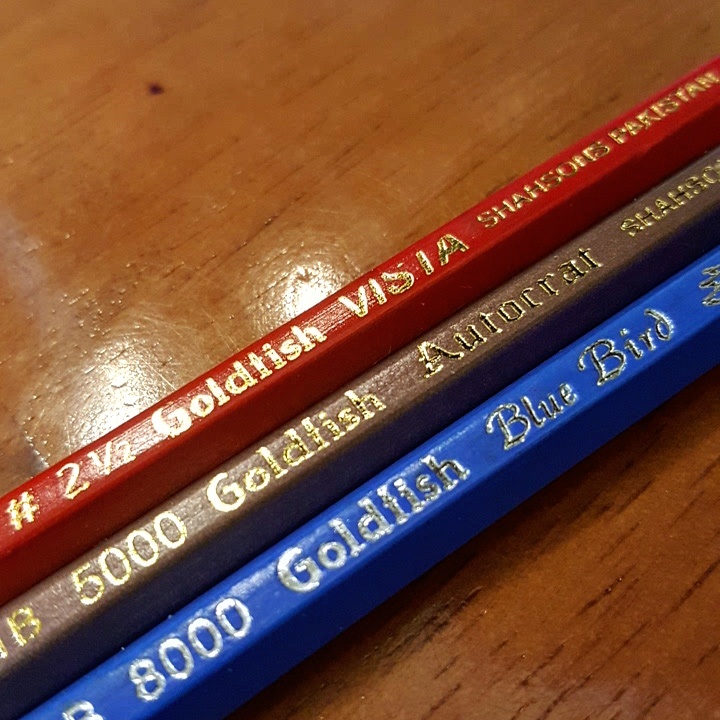 They only really do two lines of the pencils, the Goldfish, which was since been expanded with lots of different branding and the Piscasso line, which is mostly drawing pencils and artist materials. I am a fan of pencils that have fun names and the Blue Bird surely delivers. The blue barrel and silver foil stamping make this pencil quite attractive, but where it excels in aesthetics, it falls short with performance (this is compared to the other two Shahsons pencils, not the entire pencils universe). The graphite core is a bit light (I'd say HBish) and scratchy on most of the papers I have used. The Vista is the middle of the road pencil here; it is a bright red pencil with gold foil stamping. It has a similar darkness as the Autocrat, but did not write as smoothly. This pencil performs well, but due to the scratchiness, I would avoid it if you like smoother graphite laydown. The Autocrat is the Cadillac of the Shahsons offerings. It is smooth and dark and point retention is on point (sorry, had to). I really like the design of this pencil as it has a natural wood veneer and gold foil stamping. The Autocrat's graphite core reminds me of the Nataraj Neon core or the Walmart Casemate core. Of the three pencils, the Autocrat wins by a long shot. Overall, the three offering from Shahsons perform well, for their price point. I would suggest trying out all three pencils, but know that you may be disappointed in the Vista. You can head over to CW Pencil Enterprise to get a hold of all three.